It's a phone, it's a fan, it's a... non-phone iPhone 4 fan? 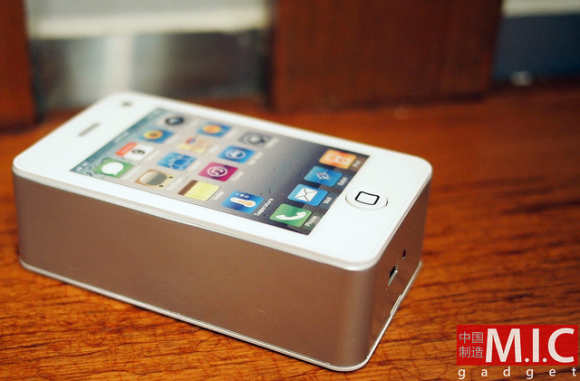 We were confused at first but the White “iPhone 4″ Air Cooler from M.I.C Gadget only looks like an iPhone – on steroids! Of course, an actual smartphone that's thick as a phone book (remember those?) is ri-goddamned-diculous, as the late John Wayne might've said. Then again, The Duke would likely have appreciated the White “iPhone 4″ Air Cooler while waiting in the wings on location in Monument Valley. 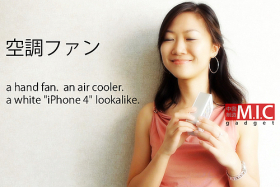 If you haven't figured it out yet, the White “iPhone 4″ Air Cooler is a cleverly camouflaged hand-held mini-fan. It may show off some style face-on (note the Temperature icon on the imitation screen) but from the sides and back it's all business. A status diode glows when users push the Home button and just beside it is the USB input. Use the included USB-to-mini-USB cord to connect to your PC or laptop for charging purposes. A full 5-hour charge of the integral lithium-ion battery allows you to run the fan for an hour non-stop, though doing so would be unusual. That flat blue spongy thing? It's a sponge: moisten it with water and your handy-dandy iPhone hand fan becomes a miniature air conditioner. Now that's just all kinds of awesome! Be sure to remove the damp sponge when you're not using the White “iPhone 4″ Air Cooler and don't install the sponge dripping wet – the device isn't waterproof. You can also add a drop of aromatherapy oil when wetting the sponge, so that the forthcoming breeze wafted by the 7000-RPM fan carries your preferred fragrance. 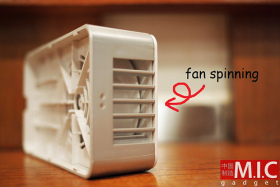 The fan fans at M.I.C Gadget state the White “iPhone 4″ Air Cooler costs 68 yuan (about $10) each which isn't too bad, especially on a hot, dry summer's day. “A hand fan. An air cooler. A white 'iPhone 4' lookalike.” Even the sales copy is cool.